I just spoke to a young lady this morning who cosigned on a vehicle. The other person on the hook for the vehicle debt has just filed for chapter 13 bankruptcy. The vehicle is not going to be reorganized through the chapter 13. Thus, the auto finance company has the right to modify the automatic stay and pursue the codebtor. However, the codebtor, who possesses and drives the vehicle, intends to continue to pay for the vehicle. The question now has arisen as to what is the status regarding the ownership of the vehicle? Additionally, the person filing bankruptcy wants to meet with the codebtor at the DMV and transfer ownership of the vehicle. There is no way that actual ownership can transfer clear title due to the fact that there is an existing lien remaining on the vehicle. I advised the possessor to use caution and to not sign anything without having it first reviewed by counsel. What makes matters even more difficult is that the debtor and the codebtor have an estranged relationship. Here is the biggest problem that I see: If the non-filing debtor continue to possess and pay for the vehicle through conclusion, eventually receiving title, will the bankruptcy filer who made no payments on the vehicle actually sign over title to the person who did pay? If not, you have an issue as to who has the legal right to possess and or transfer the vehicle. In either event, the two parties will need to cooperate on the execution of specific documents to effectuate the transfer. The above example just illustrates how difficult and problematic it can be when one cosigns a debt for another. This is especially true in the case of vehicles. 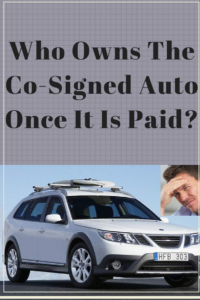 It is very common for a cosigner to be the subject of collection proceedings because the original debtor decided not to pay on a vehicle. The vehicle gets repossessed, sold at auction and a deficiency judgment is sought against the remaining debtor. In the chapter 13 scenario, a debtor can surrender the vehicle, often times in satisfaction of the debt and the creditor can only pursue the codebtor. In this particular example, the one bright spot is that the non-filing debtor actually possesses and pays for the vehicle. If this was not the case, the codebtor would be on the hook for a debt on a vehicle that it does not possessed or drive. That would be the equivalent of adding insult to injury. The take away from this article is to be very careful with regard to any cosigned debt. It is advisable to have a separate agreement between the two debtors as to who is going to possess, pay, and maintain ownership of the cosigned vehicle. If at some point, ownership is to transfer, then it needs to be documented in writing and signed by both parties. Otherwise, a debtor can find him or herself in a situation where they are paying for a vehicle that they do not exclusively own in the long run. For more information, you can contact my office directly at 847-520-8100.